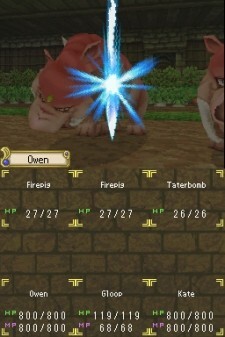 Dungeon Maker allows gamers to create their own anime-inspired dungeon adventures that begins with the player "Owen" meeting a "talking" shovel and from their, your little town is soon to be overrun by a vast range of strange monsters. Thankfully the Mayor of your town has offered its townsfolk a reward for removing these creatures and this is where you come into play. Armed with your shovel, the only way to help these creatures "move" on is to create a dungeon that they will migrate too and of course you can explore these environments and destroy these nefarious creatures. Although Dungeon Maker may have elements of Sim City and Dungeon Keeper, the game itself is quite lightweight as you can only create ten squares of dungeons before getting too tired and you must return home. Thankfully, the rooms or squares that you dig allow you to add a selection of different dungeon rooms, ensuring for some interesting and at times challenging gameplay as you progress. 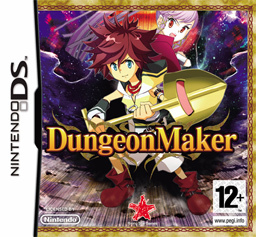 Interesting enough, Dungeon Maker does not really use the innovative control system of the Nintendo DS which means don't expect to use the stylus to create some interesting level designs, rather, all you really need to use are the A and B buttons. The combat system of Dungeon Keeper is actually quite interesting as features a wide range of opponents from Goblins to more powerful "boss" inspired creatures. 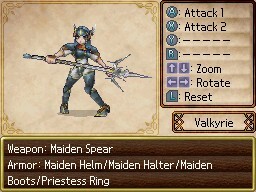 You can also explore the "dungeons" that you create to find items which have been dropped by the characters you defeat. These can then be either used or taken back to the town to be sold. The core of Dungeon Keeper unfortunately becomes a little too repetitive because every morning you enter the dungeon, defeat your enemies and of course make your dungeon bigger. For more mature gamers, this may become a little old too fast, however for the younger games, this will definitely keep their interest. Where the title does shine is through its basic RPG system and the two characters who accompany you on your adventures that include a jelly like blob called "Slime" and your school friend Kate. Once you have defeated your enemies, you can cook their "meat" to assist in increasing your statistics. 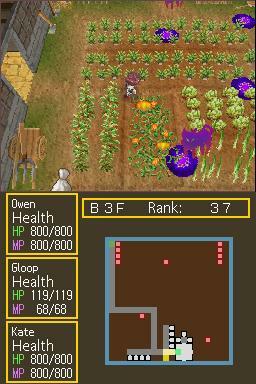 Graphically, Dungeon Keeper is visually colourful on the Nintendo DS with anime type graphics that actually match that lightweight storyline. 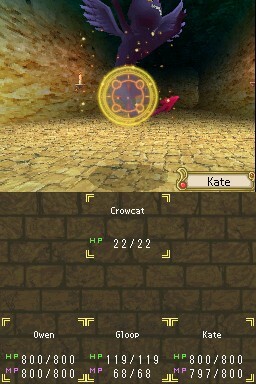 It is also at times reminiscent of those old Ultimate and Wizardry games with the 3D maze battles. The characters are well animated and at times quite detailed for their small size that when matched with the gaming environment makes for a fun graphical experience. In conclusion, Dungeon Maker is probably a good game for the younger player, however older gamers will find this title quite substandard at times. However if you are after a user inspired Dungeons & Dragons inspired game where you can to some extent control the gaming environment, than this is the game for you. And as Dungeon "Maker", you get to control how difficult your creations are, it's RPG-lite for kids!